Bennett currently has a strong need for open deck owner/operator teams with active security clearances. We're offering a $4,000 sign-on bonus (payable in increments until six months of service) for these active security cleared teams. 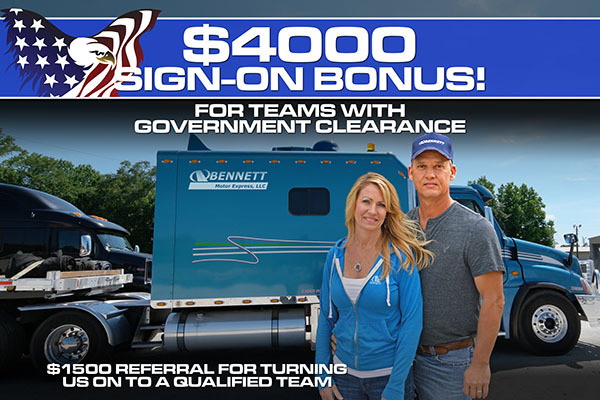 Additionally, we're offering a $1,500 referral bonus to current Bennett owner/operators and drivers for referring a security-cleared team that leases on with Bennett Motor Express/Ace Doran Government Services. When you join Bennett, you are not just working for a company, but rather you become a member of the Bennett family. If you are an experienced owner operator, or you're currently running as a team and are looking for a path toward security clearance, look no further than Bennett. We provide the support to get your clearance paperwork submitted. You can haul government and general freight while you wait, then work inside of our network of security cleared owner operators to find a suitable partner to join with to run as a team. Talk to a recruiter today about the great opportunities to become a government secure team.